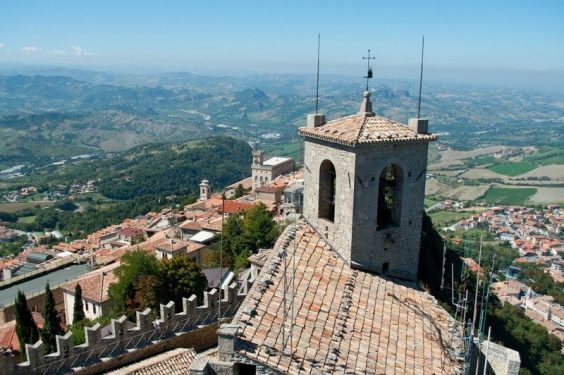 San Marino might be the smallest Republic in the world at 62 square km but it punches well above its weight when it comes to ridiculously spectacular views. 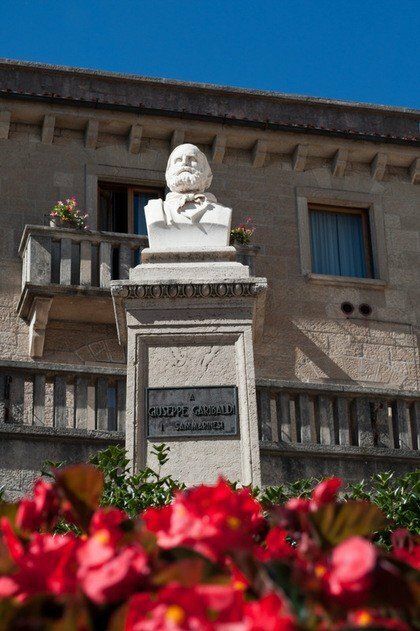 I went to San Marino on a day trip from Bologna to see what surprises the third smallest state in Europe had in store. 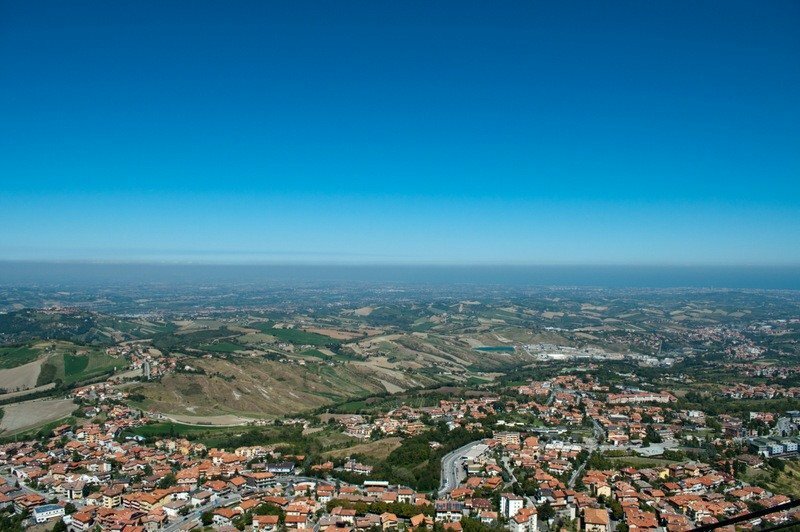 I wasn’t disappointed and, be warned, the camera went into overdrive on those stunning San Marino views! From Bologna I took the train to Rimini and from there the bus to San Marino. The bus climbed higher and higher as the road twisted upwards – Mount Titano towers 739 metres above sea level and my ears actually popped on the way up. I knew for sure I’d arrived in a new country when my mobile pinged a ‘Welcome to San Marino’ text – cool! 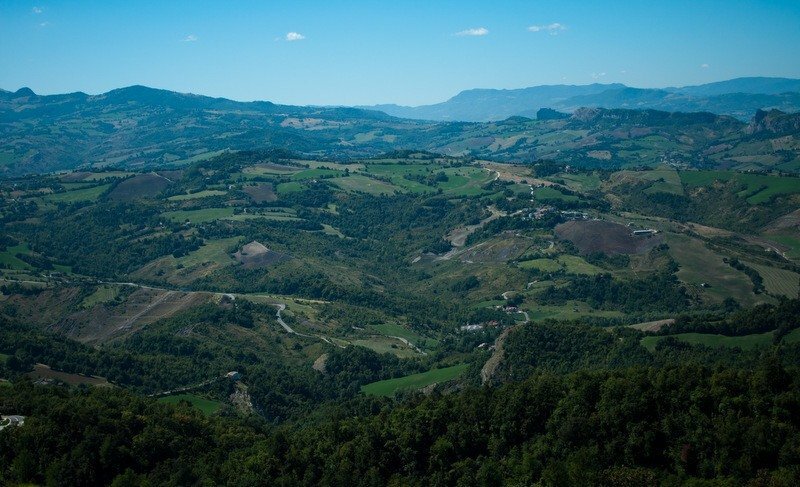 We arrived at the coach park and as I climbed off the bus I turned and caught a glimpse of the first of the day’s views – the sun was shining, it was a clear day and miles and miles of lush green Emilia-Romagna countryside stretched ahead before rolling into the distant Apennines. Just gorgeous! 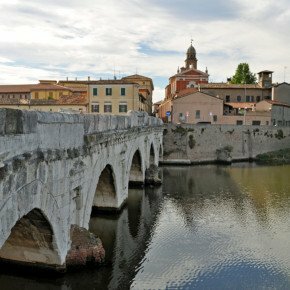 I tore myself away from the epic panorama and made my way upwards towards the town; I only had a few hours and wanted to see as much as possible of this tiny enclave bordered on all sides by Italy. 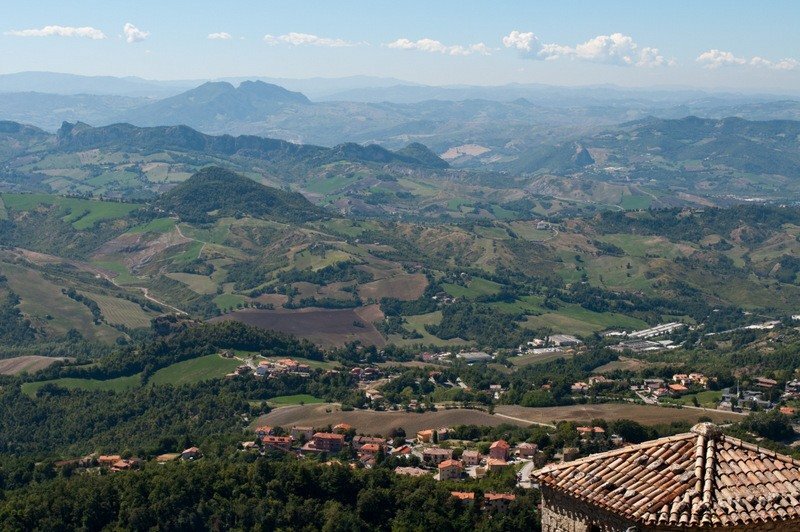 Mount Titano is a balcony of rock offering a panoramic view of the Upper Marecchia Valley and Montefeltro across to the Romagna coastline and the Adriatic which I soaked up as I walked the boundary of the city. 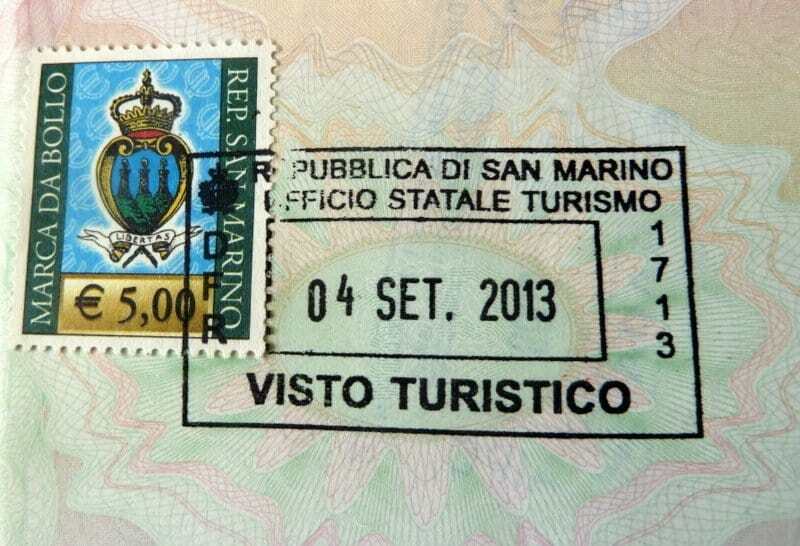 First stop was the tourist office where I got a brand new and very pretty ‘San Marino’ stamp in my passport and a new country chalked up on the list. The republic is big on postage stamps and claims to have one of the best postal systems in the world. Drop into the Post Office, if you’re a collector, and take home some stamps and a San Marino Euro coin – both collectors’ items. Onwards and upwards I climbed through San Marino’s criss-crossing steep streets to the old town centre on the top of Mount Titano, a full 750m above sea level. It’s closed to traffic and contained within medieval stone walls. 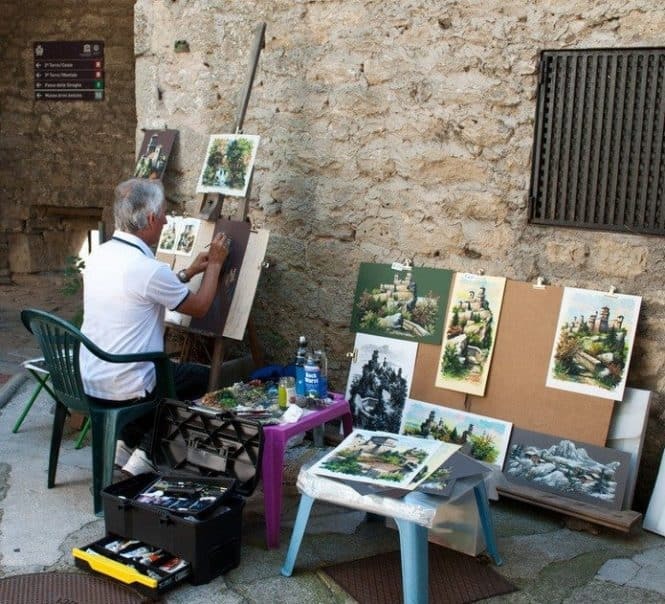 The old town is full of welcoming cafes, street artists and boutiques selling handbags, clothes, ceramics and, surprisingly, firearms and knives. 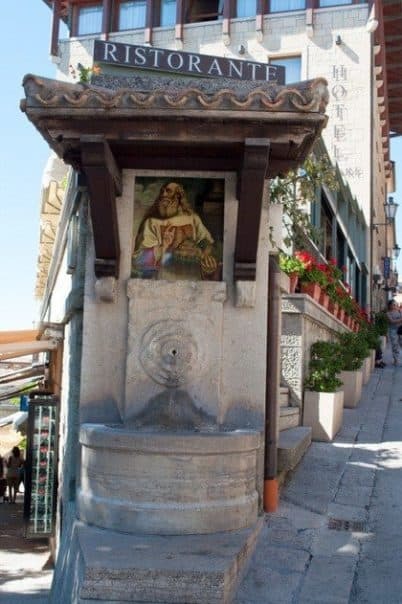 Banks are plentiful, maybe cause San Marino is one of the wealthiest countries per head with a population of just 30,000. Many goods are tax-free so the shopping attracts tourists on the hunt for bargains. The prices for food and drink were reasonable and lunch was a tasty ham and cheese piadina (flatbread) with a beer for €4.50. 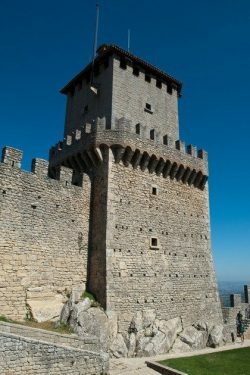 The high point of my visit were the fortresses of San Marino. Turreted, castellated, fairytale towers reaching skywards into the bluest of skies and linked by a winding path that runs the entire ridge of the mountain. 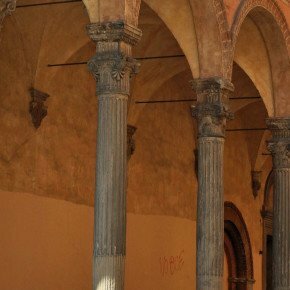 The towers were built to protect the small state from Emilia Romagna’s Malatesta family. The first and oldest tower, Guaita, is surrounded by two circles of city walls, one of which can be walked. The tower housed prisoners right up until the 1970s. The pathway connecting the towers “Passo delle streghe” means Passage of the Witches. The name is pretty apt in this fairytale scene but sinister because it’s where the hanging of witches took place. I could imagine seeing winged monkeys in waistcoats swooping down on me Wizard of Oz style had the day been dark and overcast. But it wasn’t and the blue skies were the perfect backdrop. The pathway is the one of the best places to photograph both the first and second towers and has some of the most gorgeous countryside views. But the view from the top of Cesta back to Guaita is the one that totally took my breath away. It’s possible to climb right into the roof of this tower but there’s a steep step-ladder and a small trap-hatch. The views back to Guaita Tower from the lookout windows are worth the effort. Stunning. 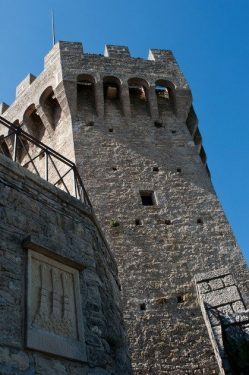 You’ll find the Armoury Museum containing weaponry and armour housed in the Cesta Tower. I became so entranced by the views that I totally lost track of the time. I missed seeing the Houses of Parliament, Palazzo Pubblico and the third, smallest, tower. 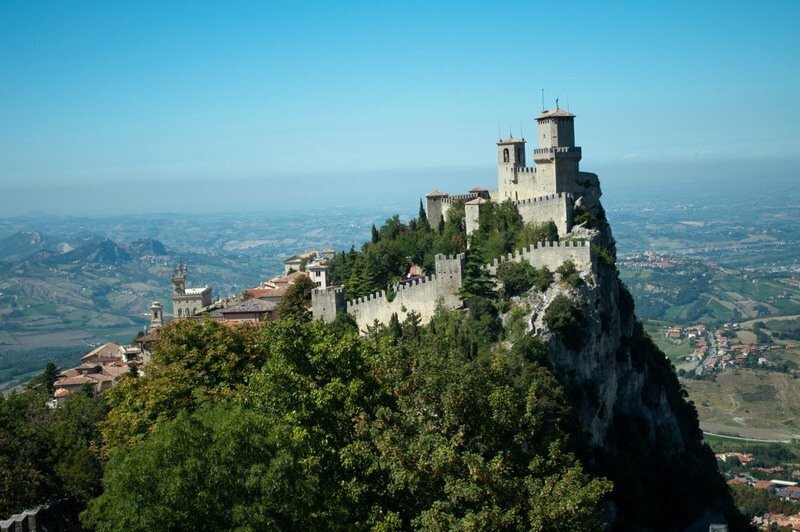 I’d loved to have spent more time in San Marino the tiny state with the big, big views. I’m told the sunsets are spectacular. Can you even begin to imagine? 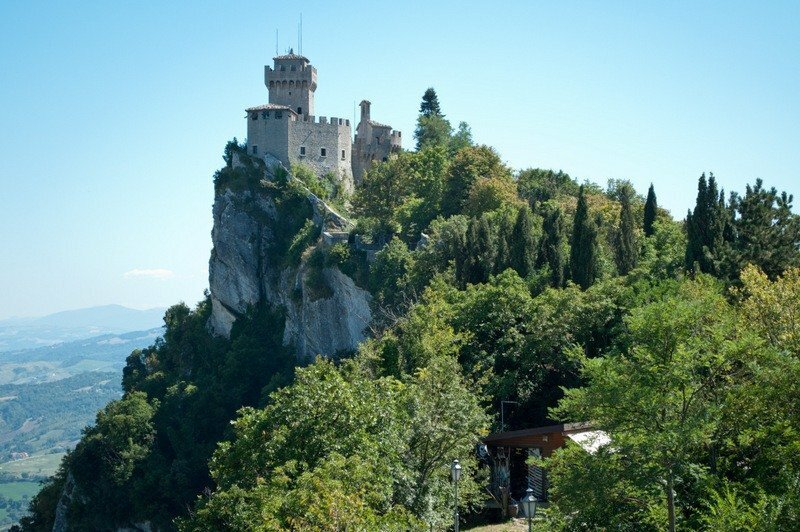 How to get there: Trains don’t go to San Marino so the easiest way to visit is to take the Bonelli bus from Rimini’s train station. The ride takes about 50 minutes and costs €4 each way. Get your ticket opposite the railway station just to the right of Burger King. 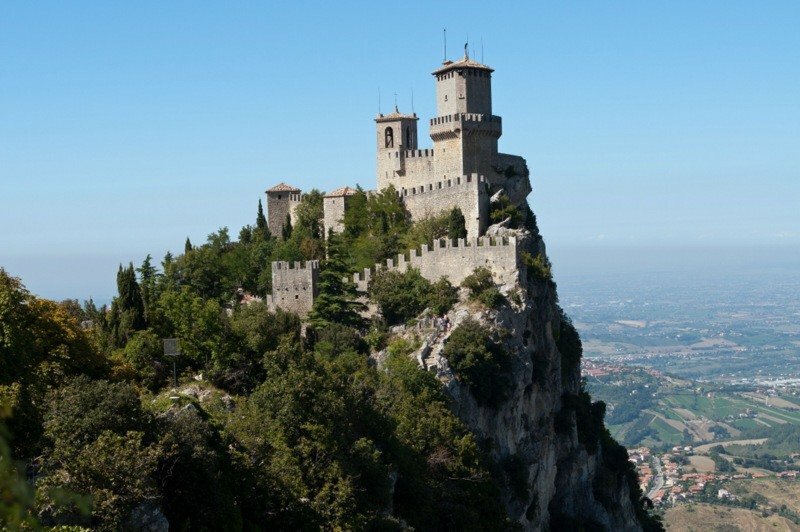 You can visit San Marino as a day trip from Bologna. The train from Bologna to Rimini takes 60-90 minutes and costs €10-20 depending on the speed of the train. The faster train is more expensive. 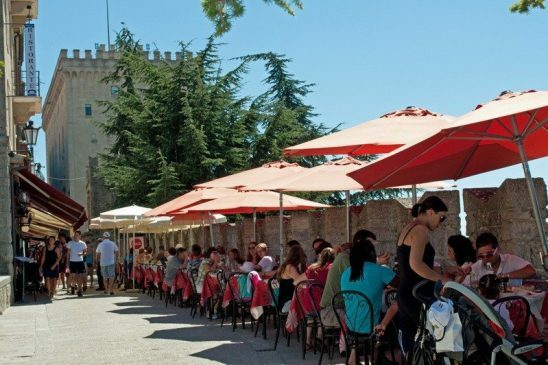 Allow yourself at least 4 hours in San Marino itself. Combined entry to Guaita and Cesta Towers is €4.50. 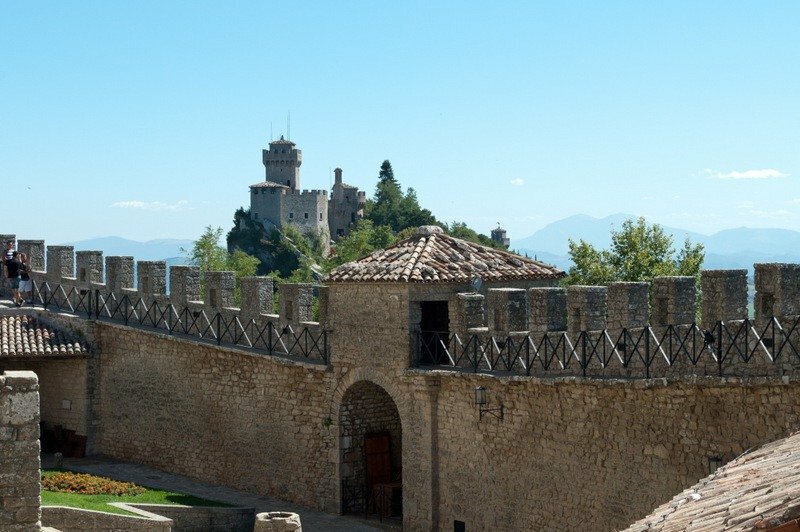 For more information check out the Visit San Marino website. 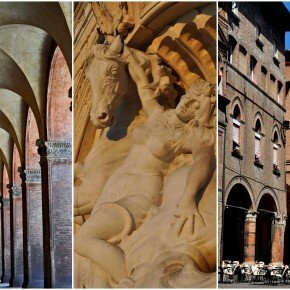 The apartment in Bologna was provided by the Emilia-Romagna Tourism Board as part of the #BlogVille campaign created by iAmbassador. As always views and opinions – good, bad or otherwise – are entirely my own. 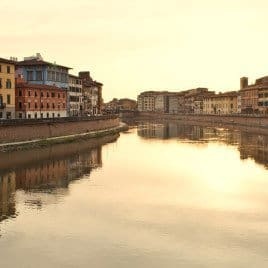 Florence is another great city – art museums, places to eat Gelato and great bargains for leather! Lovely enchanting little place – I’ll have to add this place on my bucket list. 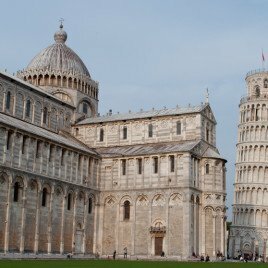 I’d love to go back to Italy – loved it. Have been to Venice, Ciprani, Rome, Milan and Lake Como. Whoo-hoo! Top of the world! 🙂 I still have the stamps somewhere. We had small boy grumbling all the way up the hill with us. He was a mad keen Schumacher fan in those days and I think he expected to see the red Ferarri nipping round one of those corners! San Marino looks fantastic, Suzanne. I’m curious if it felt as though it was still inhabited by locals going about their business, or if has more of a “museum town” feel? Either way, it’s beautiful and I hope we get a chance to make it there soon. 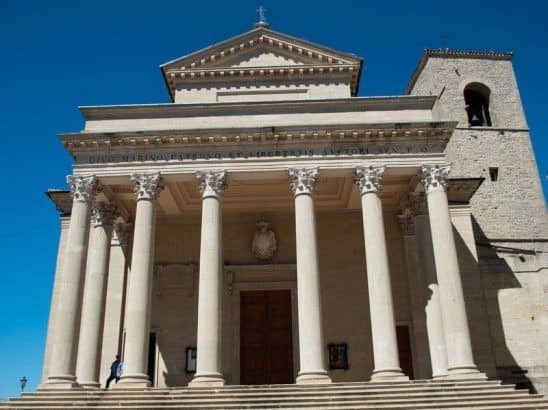 Hi Tricia – local business was going on catering to tourist needs but there are many banks in San Marino which are frequented by those looking for tax breaks. Wow that’s a stunning landscape – lucky you! “Passage of the Witches” I suppose being hung to that view is marginally better than burning at the stake! Handy for the tower too! San Marino looks so beautiful. And probably not as difficult to get to as I thought. Mind you, either way I think it must be worth the trip! I didn’t realize this was so close to Rimini. Got to get myself there sometime soon! Spectacular views! I loved your photos and the vivid descriptions made me feel as if I were there! On my list of places to visit! Wonderful looking the tower at the top of the hill! All photos are absolutely beautiful..
such a remarkable tour, thanks for sharing. Reblogged this on Quiet and exciting. Absolutely breathtaking pictures, specially of the towers. I had been under the impression that technically Vatican is the smallest nation. Absolutely beautiful photos! It seems like quite the enchanting republic. I am intrigued with your photos of Guaita Tower. 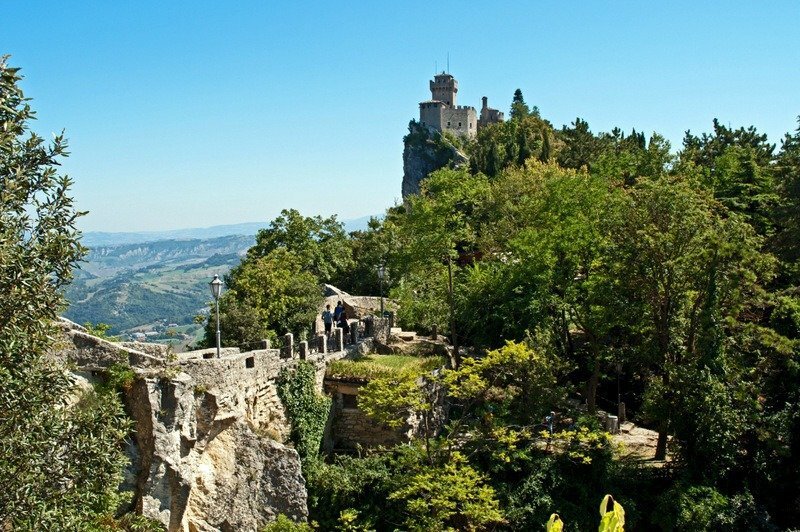 San Marino has officially been added to my itinerary for my next trip to Italy! 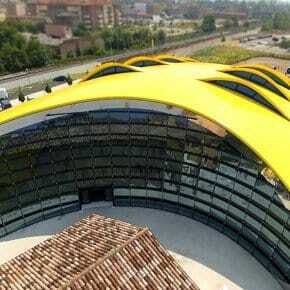 Looks a bit special – are there many hotels there if people want to stay the night? Yes there are quite a few hotels – didn’t get a chance to visit any though. Thinking of watching the sun go down? I was there so many years ago that I can’t even remember how I got there, Suze (or is that just my advancing senility?) I do remember it being a pretty spot with lofty views, and the postage stamps too. Sunset would be inspirational- I would definitely remember that! I’d have loved to have stayed for a sunset in San Marino. I’ve been looking forward to this post and it didn’t disappoint. What a magical place and lovey photographs. I do hope I get to visit there one day, it looks enchanting. I didn’t have enough time there and I’d love to see the sunset over the hills from there so I’ll tag along too please!